PowerColor published version 0.2 of its PowerUp Tuner utility, a tool for overclocking and monitoring your graphics card. You can download it over here. 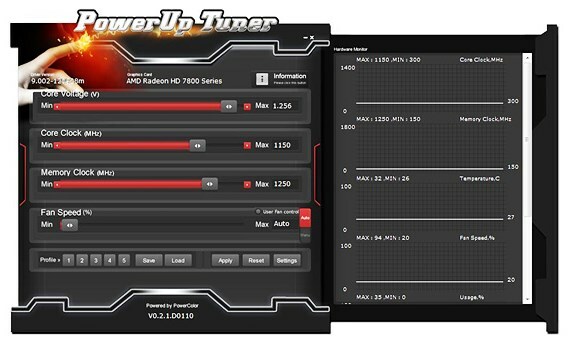 TUL Corporation, a leading manufacturer of AMD graphic cards released its overclocking utility, PowerUp Tuner, is now available for gaming enthusiasts to download. The PowerUp Tuner V0.2 allows gamers to customize graphics settings to meet their own requirements of different game titles. Gamers can adjust clock speeds, voltage power and fan speed through user-friendly control panel, even including a personalized fan profile setting function; what’s more, gamers can supervise clock speeds, temperature, fan speed, voltage power and GPU usage in time, enabling gamers to monitor the real-time graphics status. The PowerUp Tuner V0.2 allows gamers to name each profile on their own; furthermore, it has personalized profile storage to save different settings and loading records, gamers can examine GPU loading status under different applications and game titles.